Anthony Watts is keeping everyone up-to-date on the latest disclosures here. So, let me get this straight: Global warming is a "catastrophe" for the humanity, yet Jones wants it to happen so he can "wear their smug grins away." I guess it never occurs to the clique that there might be something wrong with their hypothesis. If he was unhappy with temperature trends in 2009 when the above email was written, Dr. Jones must really be glum these days. I've added an arrow pointing to the world temperatures when the email was written. Dr. Jones works for the Hadley Center's Climate Research Unit in Great Britain. The graph below was constructed from their data. 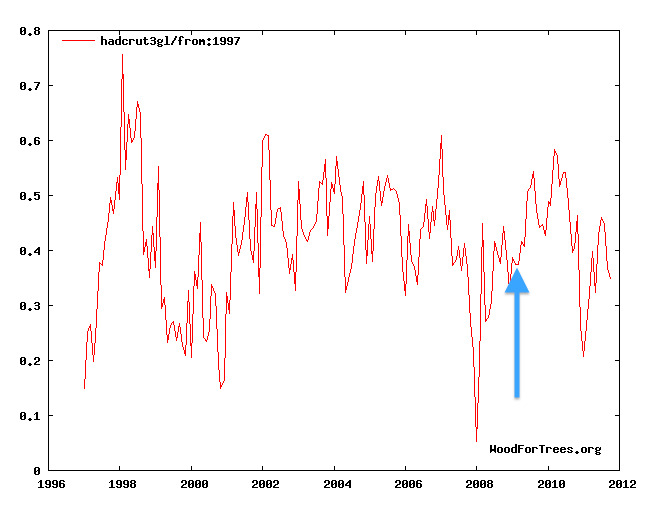 It shows no warming since Jones wrote his email lamenting the lack of warming. Neither Jones, the IPCC, nor the IPCC's models forecast this 13 years and counting without warming. And, if you have any doubt that global warming has morphed from science to religion, take a look at this. That's why turning off lightbulbs is important. To turn off the light when you leave a room is an act of piety just as much as lighting a candle in church. It has no measurable effect on the crisis at all in itself. It doesn't even have a notable effect on your own electricity bill, and if it ever does, the world economy will be in a dreadful mess. But it is a token of seriousness. It is, if you like, a gesture of faith. In the rest of science, when data substantially conflicts with a hypothesis, the hypothesis is said to be "falsified." Given the lack of warming, the lack of major storms, the lack of increase of sea level rise, etc., I believe it is time to withdraw the catastrophic global warming hypothesis and rethink the paradigms of climate science. 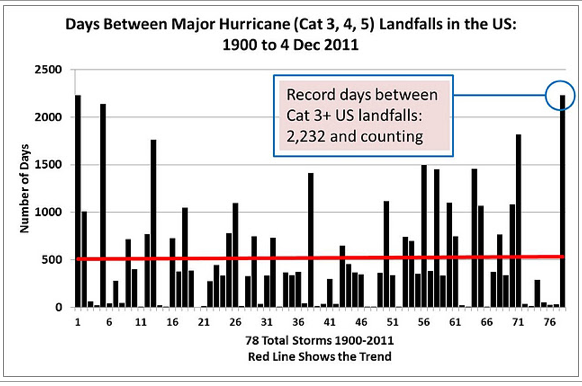 Record Set: Absence of Major Hurricanes in U.S.
Today is the last official day of the 2011 hurricane season. The biggest news this year was Hurricane Irene which was a weak storm that caused catastrophic flooding in the Northeast. But, Irene was relatively weak. My friend Roger Pielke, Jr. has an interesting blog post about a new record we are about to set: The longest period without a major (defined as category 3 or higher) hurricane striking the United States will be set on December 4 and the record number of days will increase each day until at least the 2012 season begins next summer. Roger asks the question: Who would have predicted this in the wake of Katrina when the pro-global warming people were predicting ever more frequent and severe hurricanes? The point made, multiple times, on this blog stands: There is no scientific evidence of a significant increase in major storms either in the U.S. or worldwide. For those of you that have read my book, thank you. For those of you who haven't, there is ample inventory. --- President George H. W. Bush, speaking in Wichita earlier this month, quoted by The Wichita Eagle. The same could be said for Warnings. I love a traditional barometer. I still have the one my grandmother gave me for my 9th birthday. It still works beautifully. 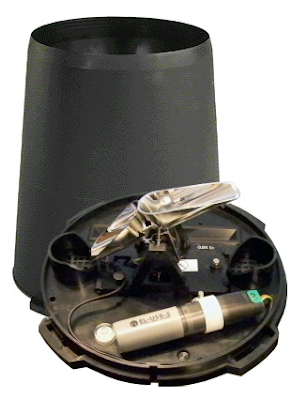 Cool tipping-bucket-type rain gauge with computer interface. Anthony has many other instruments that might make great gifts. For most people, weather is little more than polite conversation so reading a book primarily about weather may not be at the top of your reading or gift giving list this holiday season, so let me share with you the top 5 reasons to read and give WARNINGS: The True Story of How Science Tamed the Weather (Greenleaf 2010). A reader from Big D recently wrote "Hey Mike! I am reading your book WARNINGS and I am really enjoying it. A great read for those interested in the weather." From the heart-warming to the heart-wrenching and everything in between, Mike Smith above all captivates the reader while taking them on a journey that intrigues, inspires, educates and entertains. 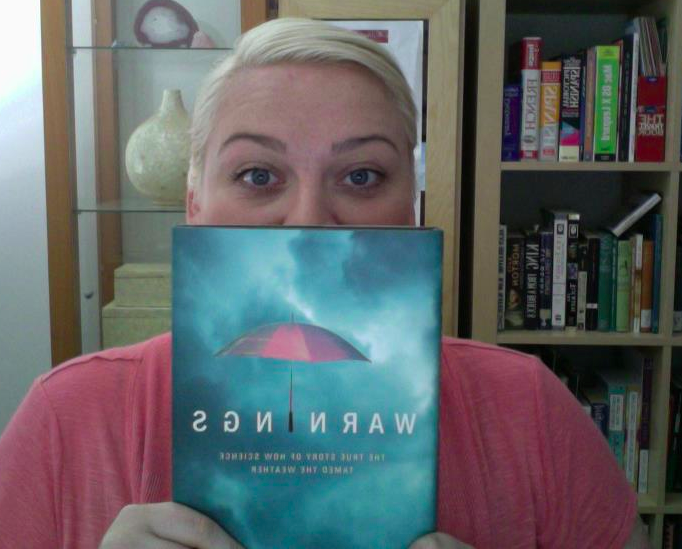 Another female reader from Oklahoma recently commented "If you have not read this book and love weather you must!" So what if weather isn't your thing? Mike Smith uses his skill as a genuine atmospheric scientist to weave together a book that has been praised for its superb storytelling by critics from coast to coast. Droughts, storms, earthquakes, hurricanes, tornadoes, dust storms, tsunamis, hail, wind, fog, heat, cold, snow, ice, rain, floooding and sleet. Do I have your attention yet? Can your business afford to be caught unaware when extreme weather threatens? Business people everywhere understand that planning ahead is the difference between a disaster and a mere inconvenience. Mike's expertise makes him the "go-to" expert when disaster strikes. The emotional and true account of how weather scientists frantically worked to save lives- and save a town. You will come away with an appreciation for the storm warnings in place today and how they have evolved into vital, lifesaving information and not treat them as a mere annoyance ever again. 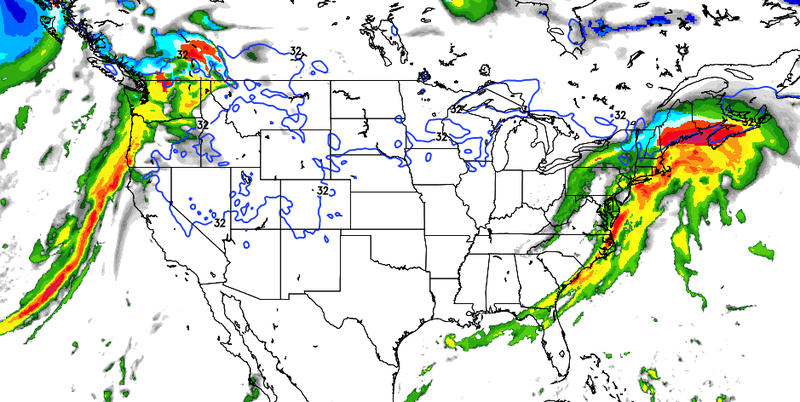 And, even heavier and more widespread snows will likely spread into the Plains Friday night and Saturday. By Sunday morning, most of the Nation west of the Mississippi will be colder than average -- in some areas much colder. Winter is coming! I have often lamented the state of science education for children. So, for the Christmas 2011 season, I am going to provide some suggestions for Christmas gifts for the budding scientist in your family. 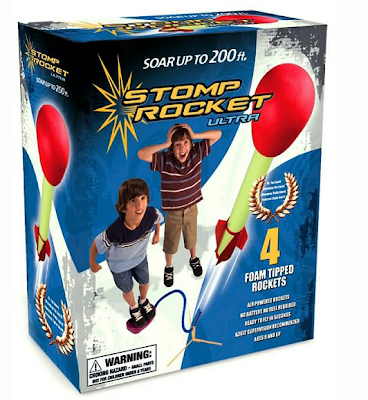 While not a directly educational toy, it does show the principle of compressing gas and it is fun. It will get the kids outside (and I don't mean just boys). This one gets a thumbs-up from me. The content of this blog is produced by Mike Smith Enterprises. 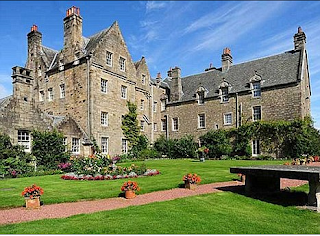 Our web site is here. We present acclaimed, professional, in-person presentations on weather safety, business risk management related to weather, and global warming and its effects on business. More information here. Called by The Examiner, "the weatherman's version of 'The Right Stuff,'" Warnings would be an outstanding Christmas present for anyone who enjoys a good book. If you would like to order an autographed copy of the book or talk with us about booking an event, call Ms. Mindy Cook, marketing director, at (316) 204-9969. 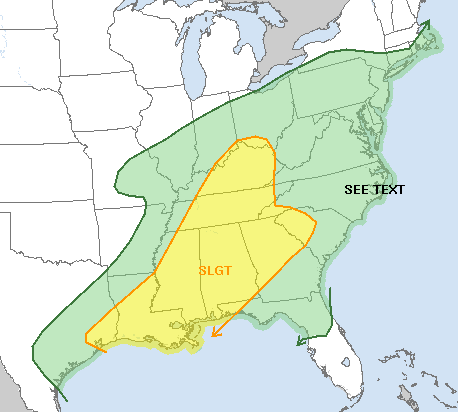 The Meteorological Musings Blog is Copyright 2011 Mike Smith Enterprises, LLC. All rights reserved. On November 11, I added Julia Louis-Dreyfus. I thought it would be months prior to having to name another worthy recipient. Unfortunately, I was wrong. In a speech last September, he said: ‘We have pledged to be the greenest government ever. We must lead by example. Leadership from government departments is something we cannot – and will not – shirk. As Glenn Reynolds says, "I'll believe global warming is a crisis when the people telling me its a crisis start acting like its a crisis." "The Authors Use a Disinformation Approach to Present Their View"
says meteorologist and climatologist Dr. Roger Pielke, Sr. commenting on yet another advocacy piece masquerading as a scientific paper in the October issue of Physics Today. Like the AMS Bulletin's recent paper on religion and global warming, these commentaries (which is really what they are) should be in the Letters to the Editor or Op-Ed sections of these journals. They should not be in the "papers" section because they have nothing to do with the science itself. I'm all for people expressing their opinions. But, opinion pieces should me accurately labeled as such. I'm so pleased that this posting received such a good response. I've received numerous compliments about how this advice kept people out of a jam. Here is my Airline Survival Guide. Google Inc. has abandoned an ambitious project to make renewable energy cheaper than coal, the latest target of Chief Executive Larry Page's moves to focus the Internet giant on fewer efforts. If Google can't afford it, who/what can? While the High Plains re still far too dry, rainfall has significantly eased the drought in the low Plains. No serious travel problems in the form of ice, snow, or flooding are expected between now and Sunday night. 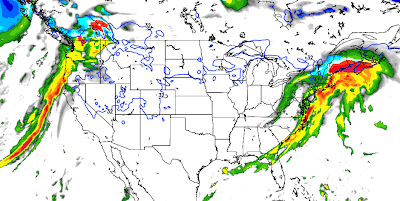 Snow may fall Monday in parts of the mid-Mississippi Valley. Over the next ten days, I'm going to have several blog posts about science-related toys and others that I believe will help children become more creative and/or come to love science. One of the areas I'm going to bring up is model railroading. Building scenery, wiring, etc., teaches many useful skills. Plus, running the trains is fun. That posting will make suggestions for how to get started in the hobby, etc. Before that blog posting goes up a few days from now, I want to say a few words to the local train stores that are in many cites. I have been in three of those stores this week, two yesterday on Black Friday. All three had in-store layouts none of which we running! I couldn't believe it. If there was ever a time to be running the layouts, it is Black Friday. Not surprisingly, there was little traffic in the stores. Meanwhile, in downtown Kansas City, Union Station's multiple -- and beautiful -- layouts were jammed with kids and their parents having a wonderful time. If someone had a display of starter train sets, they'd have sold out by the end of the day. I know a train store owner and he complains about competition from the internet. OK, I'm sure it is a challenge. But, the internet can't have a layout. It can't give lessons. It can't do service. So, lets get those layouts running! Maybe consider rigging the controls so children an push a button to sound the train's horn. I'm giving you a few days to get those layouts in shape then I hope to send you some customers. To celebrate the two-year anniversary of this blog, I'm reposting the 5 most popular items. Number 5 is about a particularly unfortunate story about global warming by NBC News. As long-time blog readers know, I'm a huge fan of Frankie Valli and the Four Seasons and the musical based on their life, Jersey Boys. For the first time ever, a Broadway show cast has done a separate Christmas album. It is produced by the original Season, Bob Gaudio (who wrote most all of their hits), and features cast members from the various companies of JB throughout the world. 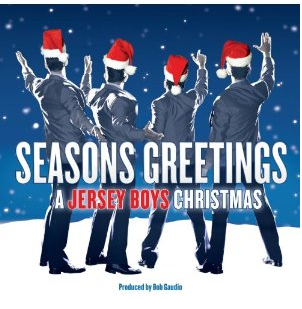 Some of the songs ("Santa Medley") are done in Four Seasons style and others are done in a more typical style for Christmas songs. Hopefully, this means many fewer nightmare commutes. Enjoy your Black Friday activities! As a friend of mine says, In America, every day should be Thanksgiving Day. Mindy and I hope you and yours have a wonderful day. The best Thanksgiving gift I can give you over this blog is the classic "Turkeys Away" episode of WKRP in Cincinnati. One blogger (HotAir.com) calls this the "greatest Thanksgiving sitcom moment in history." "Not since the Hindenburg tragedy has there been anything like this." Dr. Ross McKitrick: Fix the IPCC or Fold It! 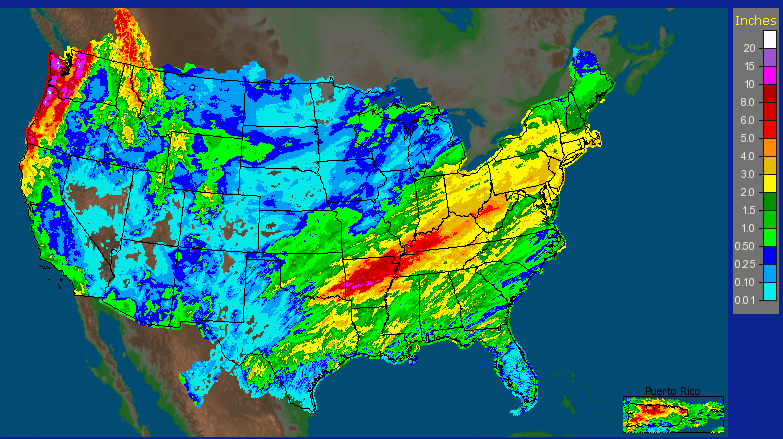 So How Did that Drought Forecast Work Out? As a meteorologist, I have to be concerned about the quality of my forecasts. I always want to know whether they are correct. On November 11, I posted a piece called Dagger in the Drought? where I forecast significant drought relief to the southern Plains between then and Thanksgiving. 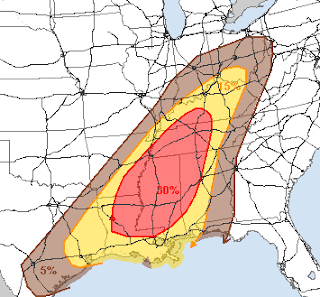 Since no rain is forecast in the region of interest tomorrow, we can go ahead the validate that forecast. 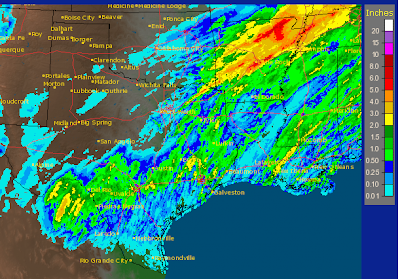 The forecast rainfall between the DFW Metroplex south to I-10 between Houston and San Antonio is too high. 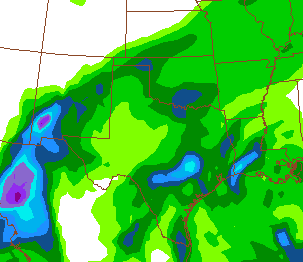 Elsewhere, the forecast is quite good (considering it is a 13-day forecast) right down to the dry area from western Kansas into northeast New Mexico. The purple on the lower map represents areas where 10 inches or more fell. 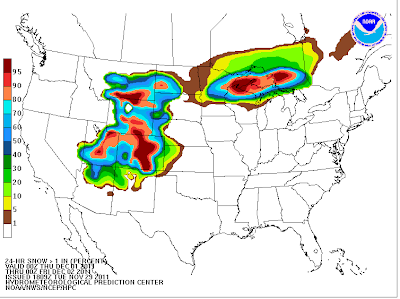 Those areas were entirely within the European model's forecast area of 5 inches or more. Remarkable! 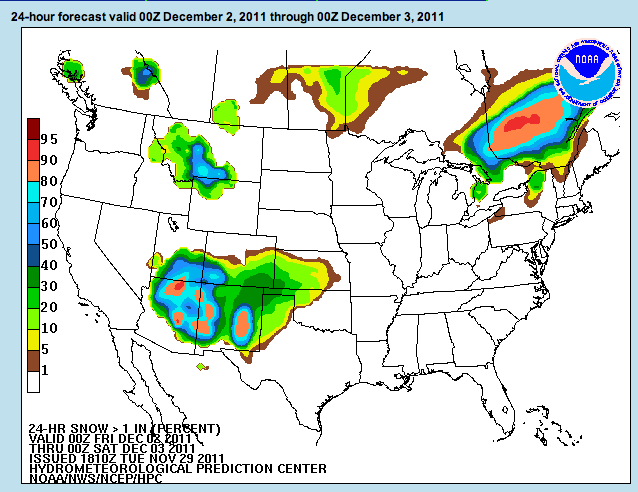 When I made the forecast, I was expecting a third storm on Thanksgiving day. 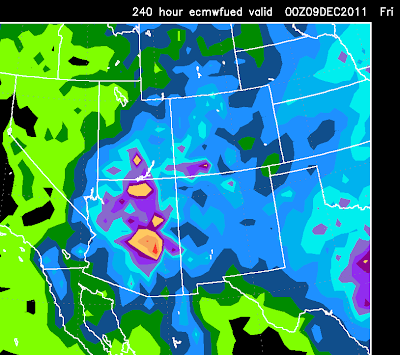 Turns out the models were about 24-30 hours too fast. It will move across the Plains during the calendar day Friday and into the pre-dawn hours Saturday. More helpful rain expected. Considering how far into the future this forecast stretched, I'd give it an A-, with the minus for the over forecast in central Texas where rains were lighter than forecast. What grade would you give it? Feel free to post your thoughts in the comments. Things are a mess around NYC but that will clear later this morning. Boston will be a mess until close to noon. Thunderstorms will be affecting a number of Florida airports. The Central U.S., other than areas of morning fog, should be fine. Seattle and Portland are dealing with heavy rain and some wind that will last a good part of the day, especially in Portland. 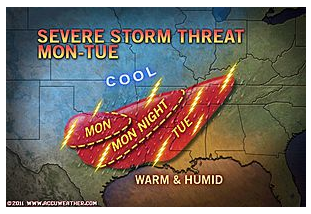 AccuWeather has a great travel weather summary here. Safe travels and enjoy the Thanksgiving holiday. As I mentioned yesterday, Climategate 2 has broken. Some background: Climategate 1 was the release of thousands of emails to and from the clique of climate researchers around the world who have been highly influential in the United Nation's Intergovernmental Panel on Climate Change (IPCC). Along with the emails was some computer code used in various climate projects. 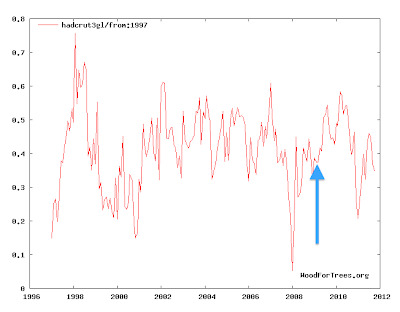 Climategate 1 was important because it cast doubt on the science behind perhaps the most important argument of the pro-catastrophic global warming case: The "hockey stick." The hockey stick purported to show that temperatures are warmer now than they have been any time in the past 2,000 years. Climategate showed the "blade" of the hockey stick to be -- and, I'm being kind here -- an invention. Climategate 1 also showed -- unquestionably -- the subversion of the scientific method by the leaders of the climate science 'cause' (see below). For me personally, this was the worst aspect of Climategate. This crew was in no way chastised when its anti-science behavior was exposed in Climategate 1. They refer to promoting the religion of catastrophic global warming as "the cause." That phrase shows up in multiple locations. And, in spite of what you are likely to read in the mainstream media, Climategate 2 clearly casts even more doubt on the science itself. All this said, I'm unlikely to get deeply into Climategate 2 because I have so many other things I'm involved in at the moment. Here is a fair news story on the latest developments. Here is the forecast radar and areas where temperatures are below freezing (blue line) for 10am EST tomorrow. The airports from Philadelphia to Boston should be a mess in the morning with numerous flight delays. Things will improve in the afternoon. 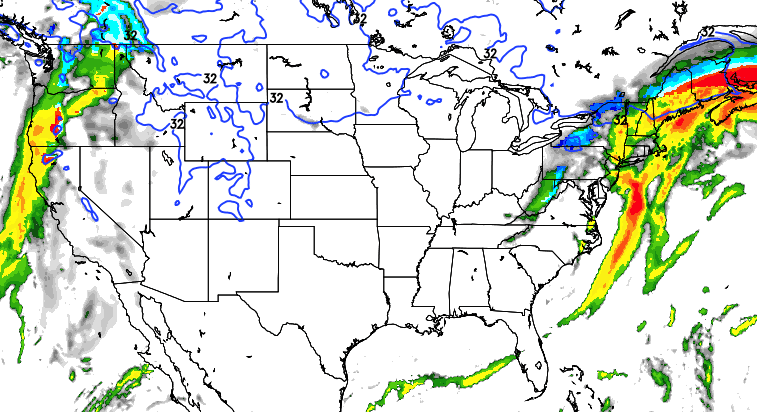 Snow is likely from northern Upstate New York through Maine with a really messy mix in southern Maine. The Central U.S. gets a break. Weather will be improving in Seattle after a windy, rainy night but conditions are likely to cause delays in Portland. However, I do not comment on these things until I have independently examined the evidence. I'm very busy with AccuWeather (my day job) work today, so I'm not sure when I'll get to Climategate 2. If you want to follow it right now, please let me refer you to WattsUpWithThat. It includes Hattiesburg, Meridian, Birmingham, and Tuscaloosa until 5pm CST. Currently: Delays of 40 minutes or more at Philadelphia, Newark and O'Hare. Note: I will not be live-blogging these storms. "Average" delays per the Federal Aviation Administration as of the time this is posted. Philadelphia = 2 hr. 30 min. Washington Reagan = 15 min. Houston Bush Intercontinental = 60 min. More delays will develop later today as the line of thunderstorms moves east. Please take a look at the Airline Crisis Survival Guide. AccuWeather will have a live holiday weather chat this afternoon. Details here. 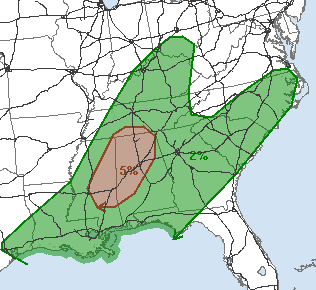 The highest tornado probabilities, which are of moderate value of 5%, is right over the the same area that suffered so much on April 27. Delays are already being reported in Philadelphia and Houston where ground stops are in place. The Airline Survival Guide is here. 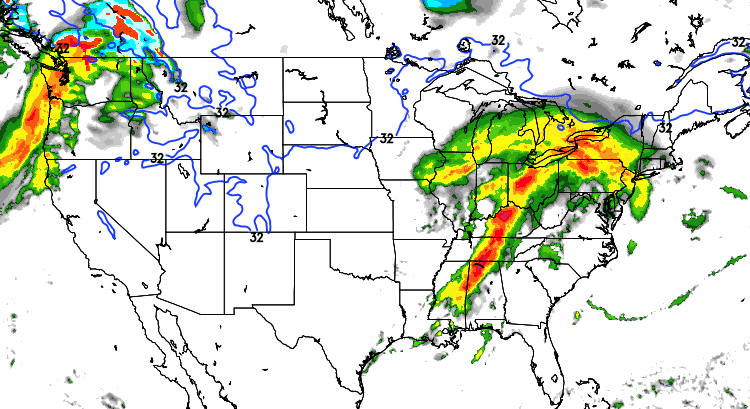 Thunderstorms today are likely to cause delays at the Atlanta and Cincinnati airline hubs. Today's winter advisories (pink = winter storm warning). 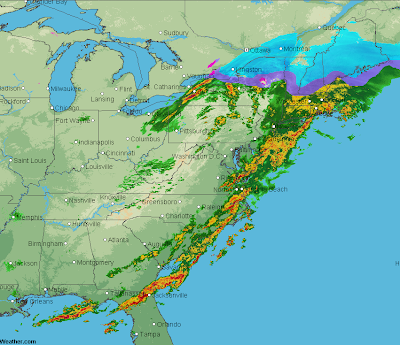 The major Northeast airports will have major problems tomorrow. Update: 7:21am... As I was posting this, a ground stop due to low clouds was put in place for Chicago. Please read the airline survival guide if you are planning to travel by air today or tomorrow, especially to Atlanta today. If you can take an earlier flight, you might save yourself a lot of trouble. 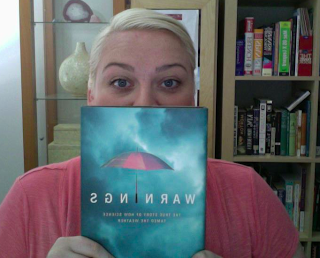 Janine Marshall lives in Perth, Australia, and -- to my knowledge -- is the first Warnings reader down under. 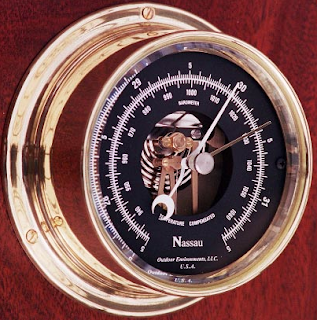 As you know, the coriolis effect causes the winds around high and low pressure systems to be reversed when compared to the Northern Hemisphere. No kidding, Saturday was "World Toilet Day." And, today, begins the World Toilet Summit. When asked what mankind's greatest invention is, I quickly reply, "music." But, "indoor plumbing," is the one I'd least like to do without. So, as Dave Barry says, let's take a few moments to observe this special occasion. Then, let's remember to flush when we are finished and wash our hands. 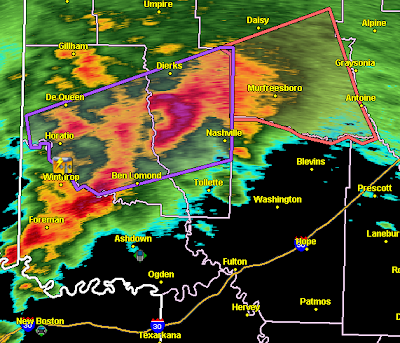 Purple is the tornado warning. A severe thunderstorm warning (amber) is already in effect for damaging winds. There are still signs that a small tornado could be associated with the intense echo south of Dierks. Also: "Massive" flooding reported in LeFlore, OK with serious flooding in several areas of southeast OK and SW and west central Arkansas. 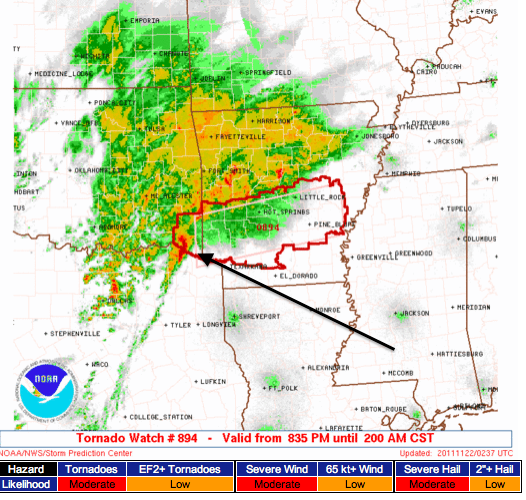 Red = tornado warnings. Take cover now! UPDATE: 9:23pm: Swift water rescues being reported in southeast OK. Maroon = flash flood warnings. 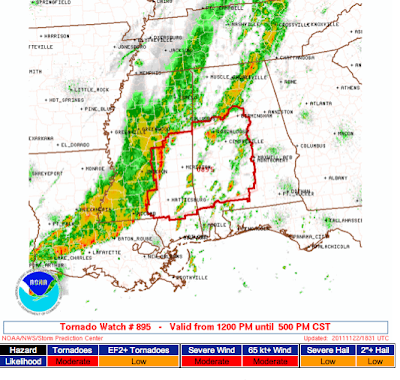 Yellow = tornado watch. Amber are severe thunderstorm warnings. 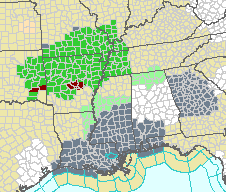 Maroon counties are extensive flash flood warnings. Little Rock had record rainfall today with more expected. Finally, the green = flood watch. The arrow is pointing to a "bow" echo which produces small -- but dangerous -- tornadoes. Watch includes Little Rock. 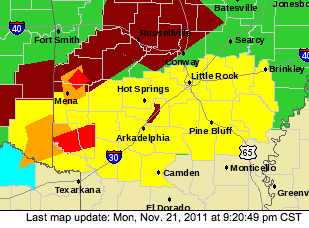 Since it is after dark, please make sure you are monitoring local media if you are in the southern half of Arkansas. From AccuWeather: Thanksgiving Holiday Weather "AccuChat"
You can get your Thanksgiving travel weather questions answered -- live -- by AccuWeather's Henry Margusity. Details here. 2. Find a nice patch of grass. It doesn't have to be big. You don't need a regulation 100 yards. Half the people in your family, if they ran 100 yards, they'd wind up in the hospital for a month. 12. It's okay to play with kids but don't baby them. Just because your 7-year-old niece is playing quarterback doesn't mean you can't intercept her screen pass and run it back for a touchdown. She's got to learn sometime not to throw into triple coverage. 13. The count is five "Mississippi." And it's a full four syllables—not a rushed "MISS-IPPI" and knocking grandpa to the ground. 19. There are only two plays you need for touch football: "Everybody Go Out" and "Everybody Go Deep." 22. A little pass interference never hurt anyone. Don't be a wimp. 24. Three-minute halftime. Don't kill the momentum. Anything longer, and aging muscles seize up. Remember: if Daddy sits, Daddy is d-o-n-e.
29. Goes without saying, but if it snows, it's a classic. 30. Take it easy. You don't want any injuries that can't be treated with a bag of frozen peas. 32. When you think about it, there's really only one rule for Thanksgiving touch football: Take your shoes off before going in the house, or Mom is going to kill you. For years I have been saying, "once the wind energy fad is over, the Great Plains will be littered with rusting wind towers." It is already happening. To the many new readers of the blog: I started out as a big proponent of wind power. Unfortunately, it has not lived up to its potential. Too many maintenance and other reliability problems when combined with the fact that wind is least available when it is needed most caused me to reconsider my position. While it may be worth continuing research into solving these problems, large scale deployment of wind power -- with the current level of technology -- is not justified. Gray = dense fog advisory, which includes the airports at Atlanta and New Orleans. There are "ground stops" imposed on some flights headed for ATL due to the fog and, while delays only average 15 min. at the moment, they may increase if the fog persists. The green areas (both shades) are flood advisories. 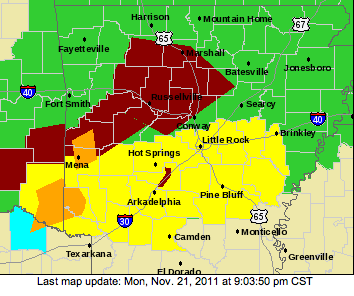 The maroon counties -- including Little Rock and Intersate 40 -- are flash flood warnings. Except along the Canada-ID-MT border, all of the precipitation is in the form of rain. 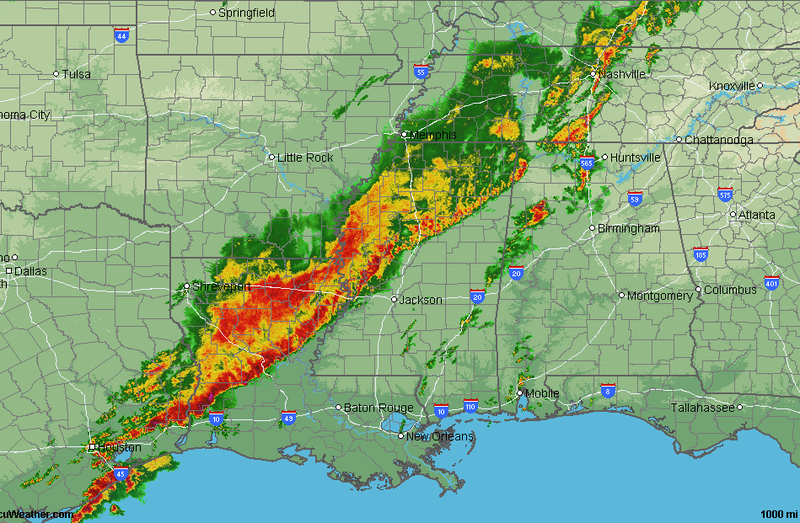 There is a line of strong thunderstorms from Cleveland through Cincinnati to Nashville to Huntsville. A few thunderstorms will also be affecting the NYC-area airports, if this is a perfect forecast. 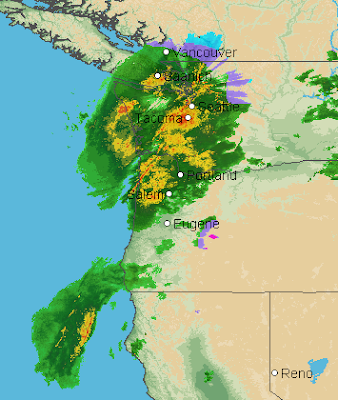 In the West, heavy rain is forecast for both Seattle and Portland. Snow is falling from northern Maine through western NY and down through the mountains of WV. 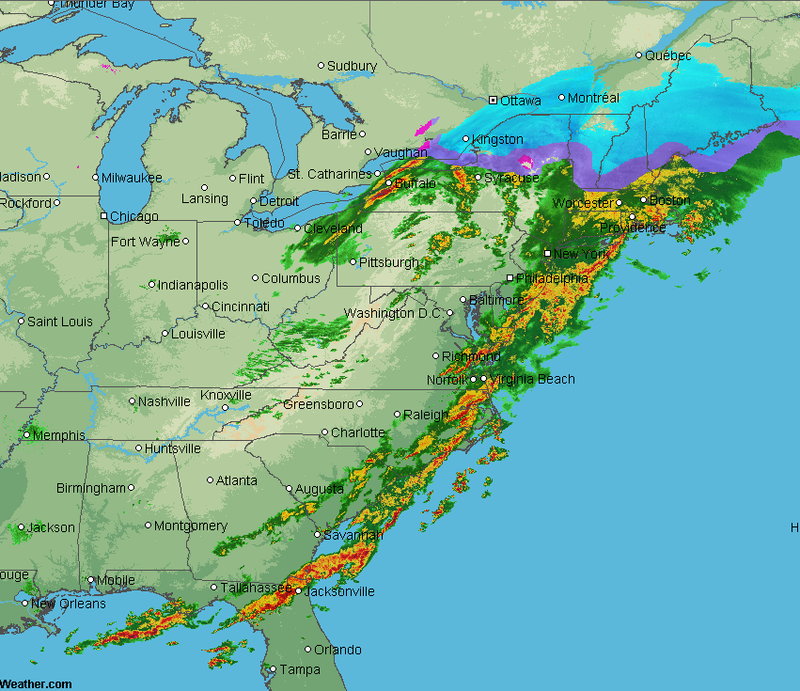 There is enough rain from NYC through Boston that there will be flight delays. “I had to read this four or five times before I believed it. It is a perfect example of what Brussels does best. Spend three years, with 20 separate pieces of correspondence before summoning 21 professors to Parma where they decide with great solemnity that drinking water cannot be sold as a way to combat dehydration. “Then they make this judgment law and make it clear that if anybody dares sell water claiming that it is effective against dehydration they could get into serious legal bother. According to AccuWeather, 42,500,000 are going to travel for Thanksgiving this year. And, while the drought relief is vital, adverse weather is going to inconvenience many people and be dangerous for some. So, I want to give a comprehensive overview so you can better plan your week. I'm really worried about this one. As we saw in the Carolinas last week, out-of-season tornadoes can be especially deadly. People don't associate tornadoes with November and/or people celebrating Thanksgiving from parts of the nation where tornadoes are rare don't know how to get the information they need then react accordingly. 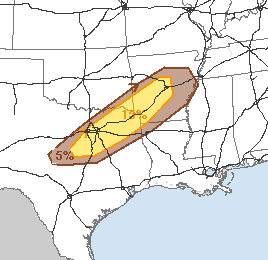 The tornado and severe thunderstorm threat is geographically limited today. Please view these as relative probabilities: 30% is a big deal 2 and 3 days out! 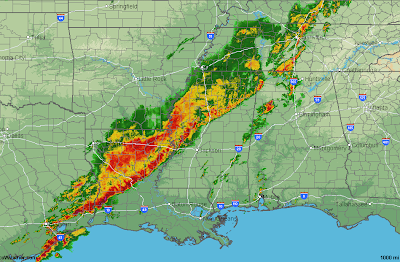 These storms have the potential to cancel flights and disrupt already packed flights. So, if you are flying in these areas, PLEASE read my Airline Survival Guide! All of the compliments I have received from fliers who have used the Guide are very gratifying...this advice works. So, put this advice to work for you. Airline hubs in Dallas, Houston, Nashville, and Cincinnati are going to be affected by these storms. If you are traveling by auto, flooding may be a problem both early this week and again next weekend in the area indicated below in both shades of green. There is the potential the flooding area will enlarge for next weekend over what is indicated here. All extra time and carry a road atlas in case you have to reroute. 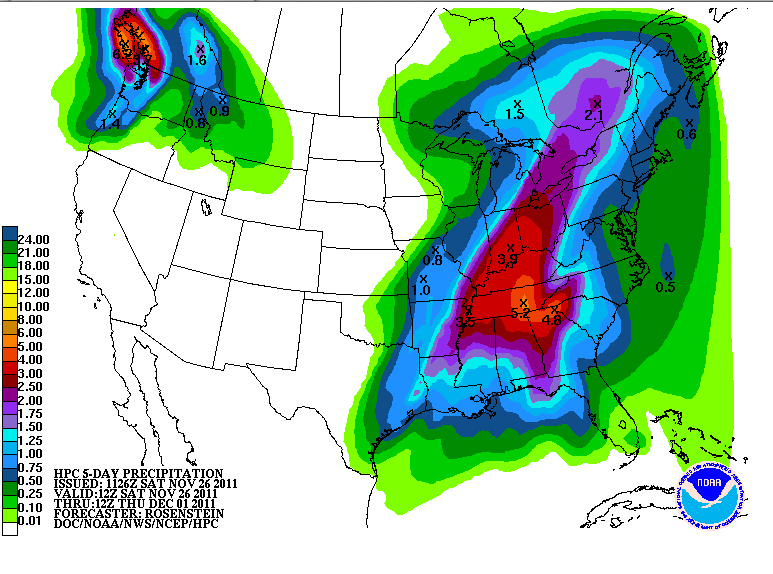 There is also a concern that some flooding may develop in parts of Washington and Oregon late in the week. There is some good news: Outside of the Sierra passes -- where it will be very heavy -- snow will not be a big problem prior to Thanksgiving day. That will likely be a different story for the return home. I'll post on that in a day or two. Please check back. Safe travels and enjoy Thanksgiving with your family and friends. We have so much to be thankful for. ...not a political story. The advice is excellent regardless of who said it. He added, "You go out and talk to people, as I do, you go out and talk to people who are really successful in one generation. They all started their first job between nine and 14 years of age. They all were either selling newspapers, going door to door, they were doing something, they were washing cars." "They all learned how to make money at a very early age," he said. "What do we say to poor kids in poor neighborhoods? Don't do it. Remember all that stuff about don't get a hamburger flipping job? The worst possible advice you could give to poor children. Get any job that teaches you to show up on Monday. Get any job that teaches you to stay all day even if you are in a fight with your girlfriend. The whole process of making work worthwhile is central." I started mowing lawns for $$ at 13. I was mowing lawns and working in a cafeteria kitchen at 15. I had a weather club that actually did weather reports on the #1 rated radio station in Kansas City at 16. Many of the well-off people I know tell similar stories. 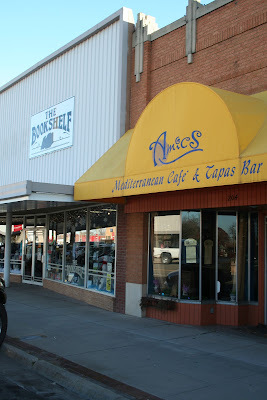 Just got back from a very successful book signing at The Bookshelf in McPherson. 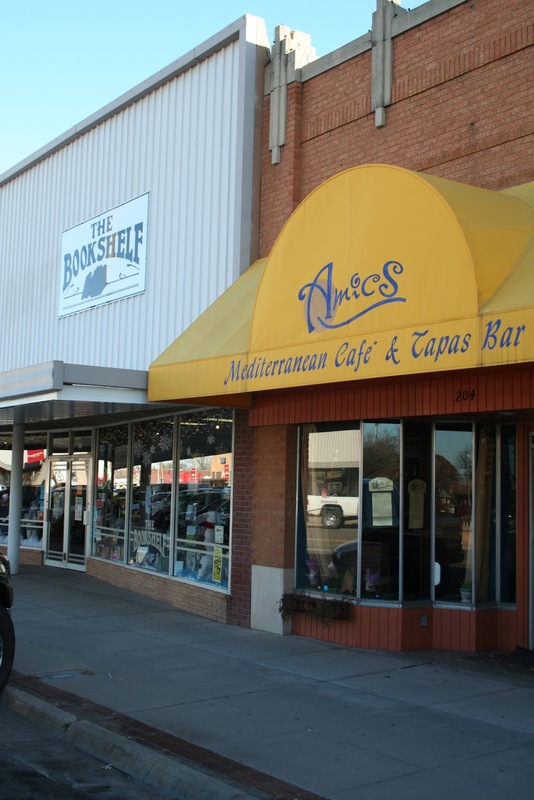 McPherson is a pretty small Kansas town with a busy downtown. Linda and crew did a great job of planning and holding the book signing. It was wonderful seeing long-time friends and making new ones. One of the most gratifying moments was having a Warnings reader who so enjoyed the book he purchased six more for Christmas gifts! From our friends at State Farm, here are instructions on how to safely fry a turkey. Okay, maybe it isn't magic, but Mindy and I are on our way to McPherson to The Bookshelf where I will be signing copies of Warnings: The True Story of How Science Tamed the Weather from 10am until noon. You can get some early Christmas shopping done! If you'd like to give an inspiring and uplifting book, you can look at the reviews at the above link or at the Mike Smith Enterprises web page about Warnings. 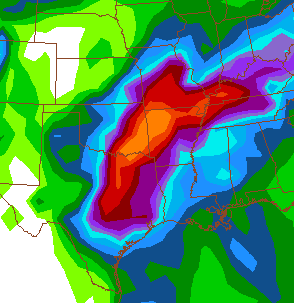 How is that Drought Relief Coming? Sunday, I wrote a posting, "Dagger in the Drought?" where I predicted that significant drought relief would occur along and south of I-44 in Oklahoma and Texas by Thanksgiving. 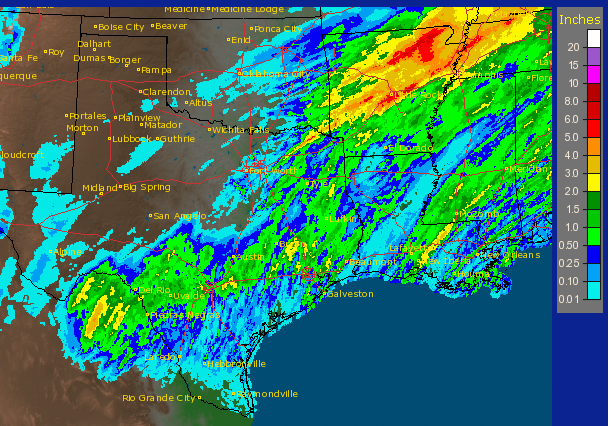 One inch or more of run was widespread from Laredo and Del Rio, TX into Arkansas with very heavy rains from southeast Oklahoma through the northern half of Arkansas. So far, so good with round 1 of the rain. The orange areas within the red are forecast amounts between 4 and 5 inches. If you add up the amount of rain that has already fallen with what is forecast, Sunday's original forecast still looks quite good. 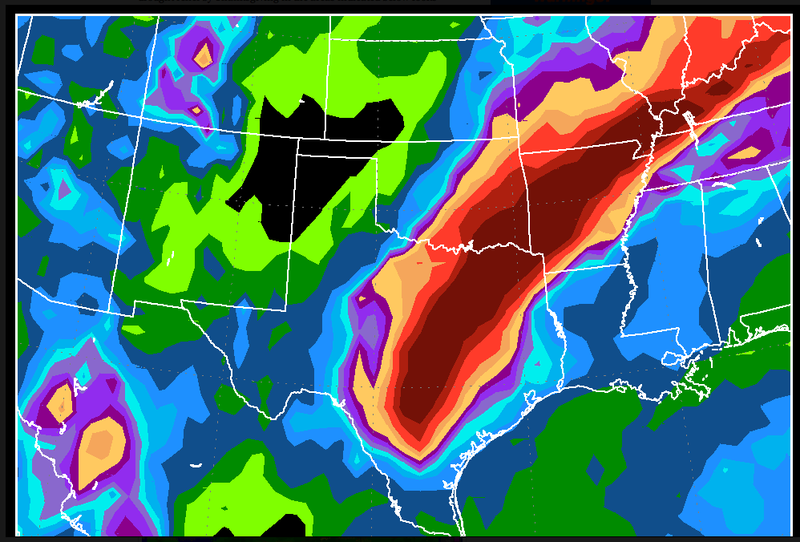 The bright orange area from just north of Dallas to the Ozarks is more than 5 inches! 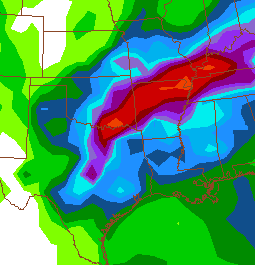 If this forecast is correct, it would -- when combined with the rains that have already fallen -- be quite significant. 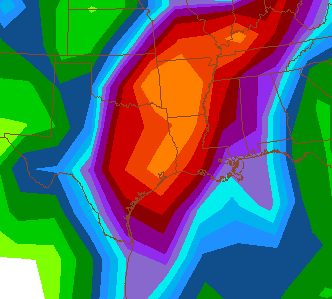 That is an additional 3 inches or more over the east halves of Texas and Oklahoma, with some areas forecast to receive 10"+ over the next 16 days. 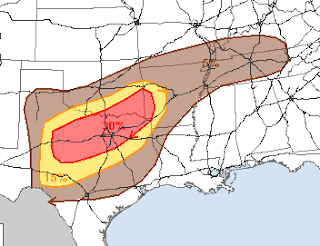 The southern High Plains' extremely severe drought would not be affected. Elsewhere, it would certainly improve the situation along, south and southeast of I-44 with some lesser easing over the rest of Oklahoma (except the Panhandle) and the southeast third of Kansas. This would be a tremendous boost for the winter wheat and for pastures throughout the region. On The Road Again to McPherson, Kansas! This Will "Unsettle" the Science! The Morality of "Climate Change"